Non enveloped, icosahedral virion with a double capsid structure, about 65-70 nm in diameter. 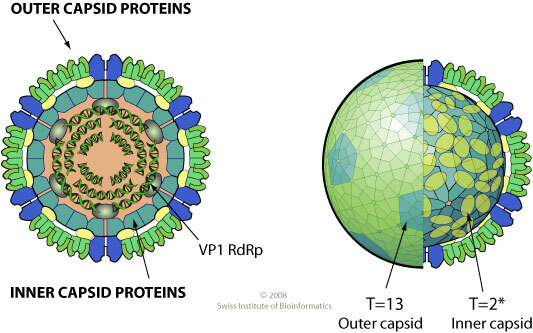 Pentameric turrets sit on the outside of the innermost capsid. The outer capsid has a T=13 icosahedral symmetry, the inner capsid a T=2* icosahedral symmetry. 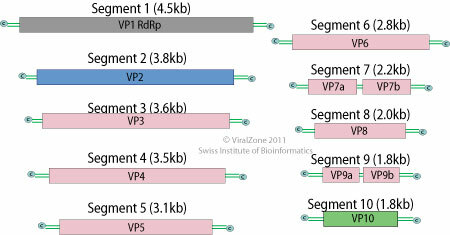 Segmented linear dsRNA genome. Contains 10 segments coding for 12 proteins. Segments size range from 1.4 to 4.5 kb. Genome total size is about 27-30 kb. NATURAL HOSTS Plants (Gramineae and Liliacea), planthoppers (vector). GEOGRAPHY FDV: Australia, Fiji, Madagascar, New Britain, New Guinea, New Hebrides, Philippines, Samoa. OSDV: widespread in Europe except in the warmer areas where the vector does not occur. ASSOCIATED DISEASES Galls (tumours) in infected plants. TRANSMISSION Transmitted by delphacid plant hoppers.